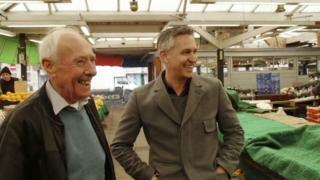 Tributes have been paid to Leicester "hero" Barry Lineker - father of broadcaster Gary Lineker. Former England and Leicester footballer Gary announced the death of his "wonderful father" to his 6.5 million Twitter followers on Monday. Mr Lineker ran a successful fruit and veg stall at Leicester Market for more than 40 years. Paul Ferrar, who took over the stall, said he was a kind-hearted man who helped him succeed. "He was my hero, Barry, I looked up to him and worshipped him because he did loads for me," said Mr Ferrar. "He really put me on the map I suppose, and Margaret [his wife], the pair of them. "They took me in and I lived with them for a couple of years when I was going nowhere." A statement from Leicester Markets said all staff and traders were "saddened to hear of the loss of one of its great traders". Graham Barry, who was friends with Mr Lineker for over 50 years, said he was "a lovely, lovely man" who spent much of his free time fishing. "He was very funny, very witty, and he used to have a right laugh," he added. "He was a very light-hearted bloke, never serious or anything like that." On Monday evening, Gary tweeted "a big thank you" to doctors and nurses at Leicester Royal Infirmary, where his father was treated. The Match of the Day presenter and his brother Wayne both helped their father with the market stall when they were younger, even after Gary became a professional footballer. In an interview on Football Focus in 1985, Mr Lineker was asked if Gary was "much good at the stall". "I think he can be if he wants to be but it's too early in the morning for him," he replied. Mr Lineker and his son returned to the market for a Walkers advertising campaign in 2013, in which they visited different sites around the UK in a camper van. Gary said that a photo taken as part of the campaign was his favourite one of him with his father. "Going back to the market where he used to work brought back lots of childhood memories for me and I reckon seeing him slogging away was one of the things that motivated me to get into sport," he wrote in the Express.